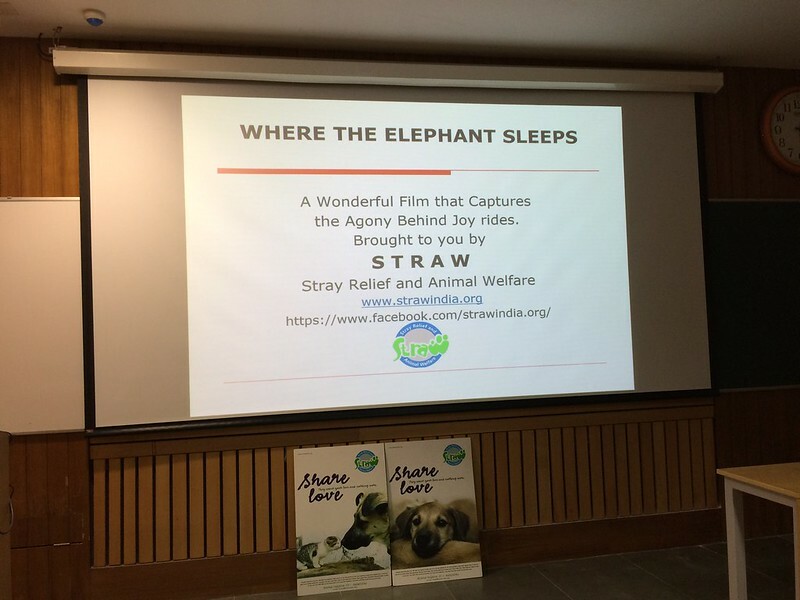 "Where the Elephant Sleeps" is a 90-minutes documentary, made by Brigitte Uttar Kornetzki, a Switzerland based film maker and activist. This screening is done by NSS-IITD in association with STRAW India. This film highlights the agony that wild captive elephants go through on a daily basis, while giving a joy ride to Indian and foreign tourists who want to be carried on elephant backs to reach the top of the Amber Fort in Jaipur, Rajasthan, INDIA. This film has won many awards and was especially selected to play at the Hyderabad World Film Festival 2017. It has been shown to European audiences and at Indian cities like Jaipur, Bangalore, Delhi, etc. This 90 minutes film was a revelation to approximately 70 students, about the agony that these captive wild elephants go through, just to make affluent tourists take that ride up the hill to Amer Fort in Jaipur, Rajasthan. The students realized that though it may seem like fun to be perched high up on an elephant’s back and to ride like erstwhile royalty, it was actually not very glamorous. The best part this event came at the end of the screening, when the students who watched the film with rapt attention, in pin-drop silence, pledged “NEVER TO RIDE AN ELEPHANT”.